How to create a necklace color scheme from an existing bead (or fabric) is one of the questions I’ve been asked the most over the years. To give my best answer to Rachel and you, dear reader, I devote this August 2010 Margie’s Muse column. I’ve also created a fully illustrated, bullet-pointed, picture-says-all PDF guide titled 7 Strategies for Extracting Palettes. Let’s discuss this question with one of the strategies outlined in 7 Strategies for Extracting Palettes. In this approach you employ all the colors of the existing source (the focal bead) in the necklace itself. 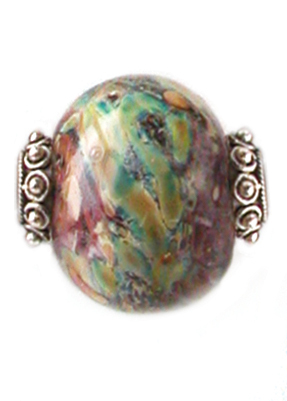 « The Fall 2010 Color Report for Bead & Jewelry Designers is here!